Jessie Oleson and I could be best friends. We both are obsessed with sweets; we both could eat dessert any time of the day; and we both hate to see any desserts go uneaten. Where Jessie and I differ, however, is our dessert imagination. While the majority of my treat ideas have remained sweet dreams, Jessie, aka Cakespy, is not afraid to transform such dreams into reality. 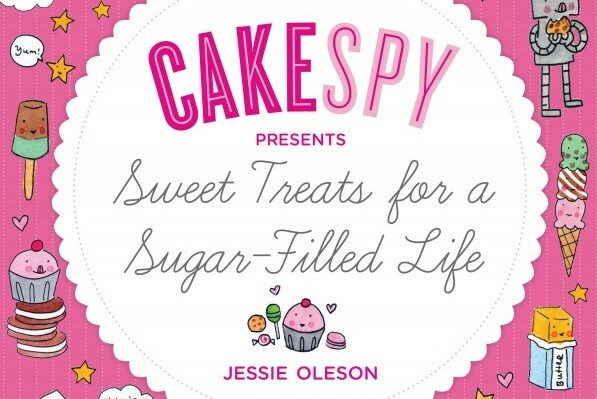 Author of the blog Cakespy, Jessie has become renowned on the blogosphere for indulging our collective fantasies with mouth-watering, over the top recipes. Now with the release of CakeSpy Presents Sweet Treats for a Sugar-Filled Life, anyone can satisfy their sweet tooth day and night from an array of creative recipes. For a breakfast of champions, why not try Cadbury Creme Eggs Benedict? Feeling adventurous? Then consider making homemade conversation hearts and candy corn for their respective holidays. And since nothing should be left on a dessert plate except crumbs, Cakespy suggests decadent ways to transform leftovers, such as Grilled Cheesecake and Red Velvet Cake Shake. We’ll announce the randomly selected winner next week on the blog. Good luck! Preheat the oven to 450º F. Line a baking sheet with parchment paper, set aside. Combine the flour and salt in a large bowl. Add the butter and cut it into the flour using two forks or a pastry cutter. Blend until the mixture resembles coarse crumbs. Add the milk bit by bit, gently mixing the dough after each addition, until the dough forms a ball (you may not need all of the milk). Place dough on a lightly floured surface and roll it into a large rectangle about ½-inch thick. Cut out rectangles approximately the size of index cards (3 by 5 inches) or smaller if you prefer a more modest portion. Make sure you have an even number of cutouts. Transfer half of the rectangles to your prepared baking sheet (if they are hard to handle, use a spatula to transfer the pieces). 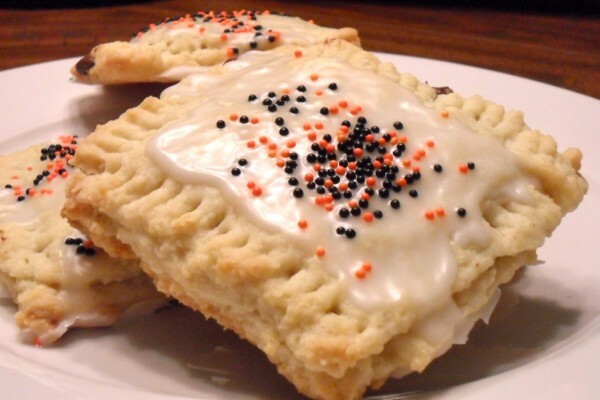 On these rectangles, place a tablespoonful of your filling of choice in the center. Add a second rectangle on top of each piece, pressing down gently to spread the filling towards the edges. Crimp all four edges with the tines of a fork to ensure that the filling doesn’t ooze out. Poke the top of each with the fork to allow the steam to vent. Bake for 7 to 9 minutes, or until lightly golden on the edges. Remove from the oven and let them cool completely. While the pastries cool, prepare the icing: In a medium bowl, mix the confectioner’s sugar with just enough cream to make a glaze that is thick but still pourable. Drizzle it over the pastries. Garnish with sprinkles immediately after drizzling with glaze. Categories: Blog, Eating, Giveaways & Products, and Recipes. Cooking Method: In the Oven. Mealtime: Dessert, Early Bird, and Snacktime. My fantasy desert would have to be homemade peanut butter cups! My fantasy dessert would easily be Bananas Foster over Peanut Butter Ice Cream, eaten on a deck overlooking the water in Figi. Oh man. My fantasy dessert is probably a “sandwich” dessert: Warm chocolate chip cookie bottom. Cheesecake filling. Brownie to top. Garnish with vanilla ice cream, Nutella sauce, and Oreos. Can you tell I can’t just pick one dessert? Layer cake…alternating between fig jam and nutella oh yeah and can two of the layers be vanilla ice cream? My dream dessert is anything S’more-related. S’more brownies, S’more cake, S’more cupcakes. Love it all! My fantasy dessert would be an Oreo + peanut butter + Nutella + doughnut + cupcake..in some way or another, haha. It would be a pistachio cream kulfi while enjoying some snowfall south of the mason-dixie line! My dream dessert is an authentic pavlova from Australia! I had it at a restaurant when I was there last New Years and its all I have thought about since! My dream dessert is nutella cheesecake with oreo pieces, chocolate chip cookie pieces, donut holes sprinkled on top. A cherry. Don’t forget the cherry. My fantasy dessert would have to be chewy, warm pumpkin chocolate chip cookies! I am dreaming about tiramisu as I write this. Huge congrats on the book! That cover is way too cute. My dream dessert would be a Reeses Smores maybe with Martha Stewart’s homemade marshmallows and graham crackers? If only I were so adventurous as to try. Haha. Seriously, though, it’s like a fluffernutter camp-out style. So yum! If I had to pick just one – really decadent warm almost molten chocolate cake with all the works – strawberries, fudge frosting, whipped cream… But, seeing as it’s that time of year, you can never go wrong with pumpkin desserts either. Yum. Tough question! My dream dessert would have to involve my favorite cold/hot and salty/sweet combo. Maybe a warm slice of chocolate cake with caramel frosting and fleur de sel sprinkled on top, with a scoop of rich ice cream (either vanilla bean or caramel) on the top that has melted a little bit. OMG. Want dessert now!